Veggie main, stuffing and gravy? It’s Friendsmas this Saturday - our ‘alternative Christmas Day’ for a group of friends which I host every year - and having just moved house I’m feeling frazzled and unprepared! Especially since one of my friends has gone veggie this year, so now I have to create three extra dishes to accommodate her! I have only ever made a small handful of vegetarian Christmas elements, so I’m looking for easy-but-impressive, tried-and-tested recipes to help things go smoothly! They were… well, people ate them, but they didn’t look stunning, so any alternatives would be great? But I would love to know if anyone has a simpler, flavour-packed veggie gravy? Thanks in advance for your help you lovely lot! Just buy something veggie from M&S. 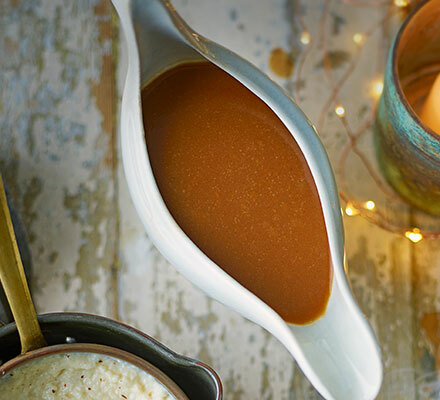 there is no such thing as a proper veggie gravy - it’ll always be playing catch up. You can’t go completely out of your way taking your time and effort away from the main point of the exercise which is to eat meat and drink wine. All your meat eaters suffer - don’t let them down! My wife is a veggie - I have thought about these issues a lot. If you made a chilli bean casserole or a veggie tagine you wouldn’t have to worry about veggie gravy ️ Mission impossible to try to create a veggie version of a meat feast and what is the point in that anyway? I wouldn’t bother with stuffing, @laura. As @JulianFox said, you can buy a good alternative from M&S. I had three vegans to accommodate last night for my party. It seems like such an odd life choice, but there you go! I’m feeling frazzled and unprepared! Your veggie friend knows what sort of meal it’s going to be, presumably she’s been before. Did she ask for special arrangements to be made just for her? Maybe she intends to relax her veggie diet this once, or maybe she’s happy to stick to the potatoes and veg part of the meal. I understand you wanting to make some effort for her, but will that embarrass her? @JulianFox has it right on the nail. There’s many special veggie/vegan Xmas dishes in the supermarkets. 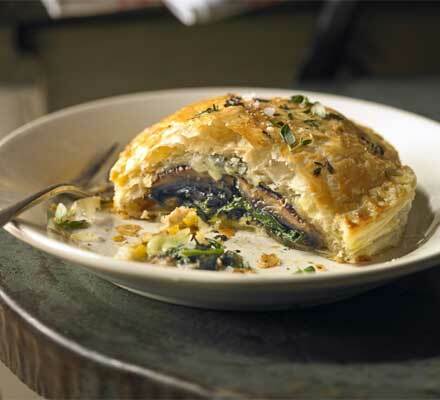 Waitrose are widely advertising their Beet Wellington; Tesco have a whole Cauliflower rubbed with turmeric en croute. Buy ready made for her, and warm up. Relax and enjoy (as much as you can) the food and company. This can indeed be an unnecessarily tricky one: without managing expectations cordially in advance it can be dispiritingly easy for both host and guest to feel awkward - whether it’s due to a disproportionately special effort being made for visiting abstainer/s or a hastily boiled dollop of pasta being deployed while everyone else feasts on lovingly prepared masterworks. I’ve experienced plenty of painful permutations of both. So don’t be afraid to sound your guest out. 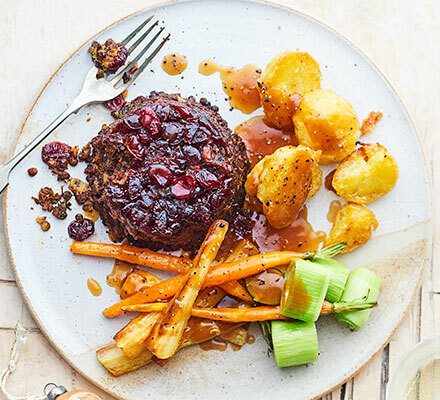 Contrary to the oft-overused trope of us being didactic pains in the braised rump, most vegans/veggies around this time of year are so utterly sick of being asked what on earth they eat at Christmas by now that they’ll be grateful for any kind of effort being made for them, whether store-bought or not - trust me! Good luck and Merry Christmas, omnivores, herbivores and all! I think the obvious solution to keep the cooking simple is to cook the same meat-free meal for everyone! 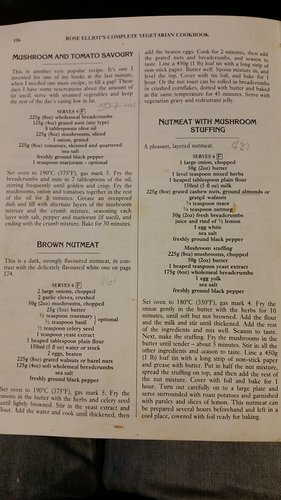 This is my favourite Christmas roast (the Brown Nutmeat) from a very ancient Rose Elliot veggie cookbook. It’s moist and delicious (unlike many nut roasts I’ve eaten over the years) I frequently add lightly fried pinenuts and often use cashews for a milder flavour; the walnuts, in particular I sometimes find rather overpowering. I ‘grate’ the nuts and make the soft bread crumbs by whizzing in the liquidizer! Incidentally whilst not trivial to prepare this can be prepared ahead of time up to but not including the roasting in the oven. It can even be frozen at that point and then roasted later (I usually portion it up and do this). So that might make it a little more manageable for a mixed dinner. 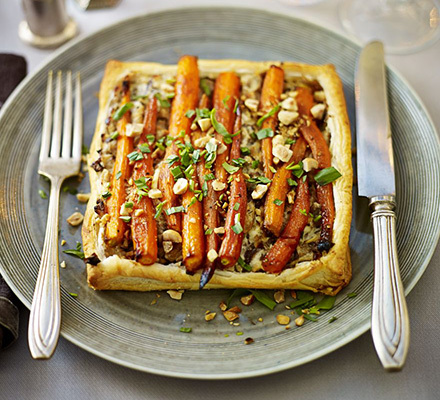 I’m doing this caremalised garlic and goats cheese tart for the vegetarians on Christmas Day. It’s a fantastic recipe and I expect some meat eaters to chose this instead of the meat. Goes well with a nice hearty red wine, too. Could melted cheese be classed as a gravy? Mushroom n’ Sherry Sauce from Sarah Brown’s Veggie Kitchen. Tips: Coarsely process rather than liquidise if you like a bit of texture. Chestnut mushrooms are more flavourful than white. 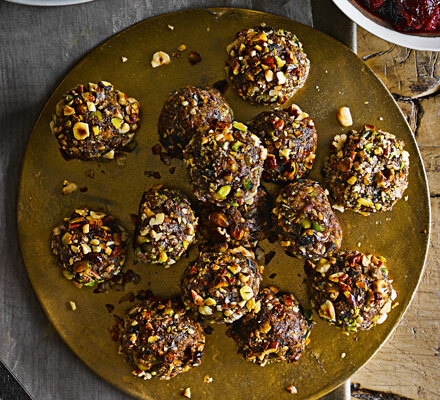 Fab with nut or meat roast. @martin_brown Another possibility is asking the veggie to bring their own. Either to fit around what you’re doing for the rest e.g. a nutroast, It’s not too difficult to make the rest e.g. roasties (use oil not lard/goose fat) veggie friendly with modest impact on flavour & the veg. obvs will be fine anyway! Or a totally different dish. 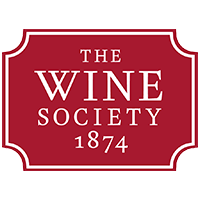 The event is to socialise primarily surely. But if they do make sure they bring plenty as everyone will want to try a bit! My partner is a lactose & gluten intolerant veggie (!). So she always offers to bring what a host may find difficult. And as you’ve just moved house I think your guests will cut you a lot of slack. You mean as long as they get some meat? I know you’re not being too serious but my experience is that if you say you’ve cooked a vegetarian meal then you get some reaction. If you just provide a nice meal without any meat people don’t really notice, or at least they don’t complain to me. Few, if any, meat-lovers eat meat at every meal. I know turkey is traditional but if I remember rightly, some 40+ years, it’s pretty dull anyway. When people come to eat at my house they know they won’t get served meat so I guess I don’t think about it much now. But don’t want to pontificate too much so I’ll shut up! @laura For someone who didn’t eat much meat I have recently gone vegetarian and don’t miss meat or fish. The gravy looks interesting to accompany the veg etc on Christmas Day so might give this a try. They do a great parsnip chestnut and Camembert pithivier which I’ve had a few times over the years. It’ll be somewhere in that room. You know, the room that’s going to be full of massive boxes for the next few months…! Woah, so many responses, and all of them very helpful! Thanks everyone. So I’ve kind of taken a pinch of advice from each of you. Those saying to chill out/just get something shop-bought etc - I hear you. I think maybe doing all three things was a bit much, what with everything else, and the house move! So… I think I’m abandoning the stuffing, and although @colinsmithathome’s gravy suggestion looks amazing (will definitely try that in the new year!!!) I think I’m going to wimp out and buy a readymade veggie gravy from the supermarket. All the recipes you posted look amazing, but think I’ll do @Inbar’s suggestion of the melty mushroom wellington as it’s so easy just to make one portion. Solution; pop over to @martin_brown’s and pick up a portion of his Saturday evening dinner! Bound to be delicious, he’s cooking veggie anyway and you’re stress free ! enjoy . If people are coming to your house. If I visit veggie/vegan friends I wouldn’t dream of asking them to cook (or bringing my own) animal protein. I appreciate that it is a little different the other way around. I wonder if I’d feel the same if the usual was to be veggie and the unusual to eat meat?